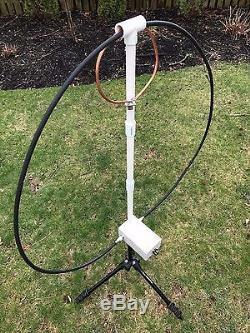 The W2LI Magnetic loop is an affordable, QRP antenna system designed for quick deployment, portable use, HOA/apartment dwellers, and excellent RX characteristics. It is compact, easily fitting into a backpack, and gives continuous transmitting coverage from 7 MHz through 14.350 MHz, covering 3 of the most popular ham bands. 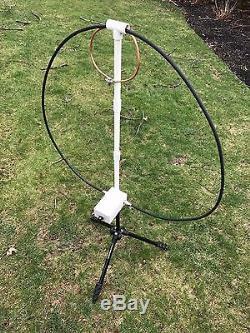 Magnetic loop antennas are known for their relative efficiency when compared to their physical size, and are known for being "quiet" on receive compared to many other antennas, especially dipoles and verticals. Tripod-mountable with standard 1/4-20 UNC tripod threaded mount built into base housing (tripod not included). Can also sit on any flat, stable surface - no tripod required for use. 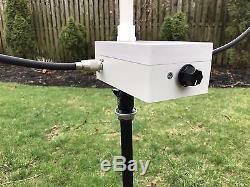 Comes with everything needed to get on the air (user supplies their own coax to connect antenna to transceiver, as well as tripod if desired). Quick, easy 2 minute assembly and break down. Durable 1 kV rated air variable capacitor, rated to 10 watts CW/PSK/JT65/RTTY, and 20 watts SSB. Continuous tuning and transmitting (1.5:1 or better SWR) coverage of the 40, 30, and 20 meter amateur bands. Continuous tuning for shortwave reception of the 49, 40, 31, 25, 22, and 19 meter bands. Outer loop made from durable LMR-400 coaxial cable. Transmit loop made from 1/4 inch copper tubing. 6:1 reduction drive (vernier drive) for easy fine tuning. Tuning knob electrically isolated from capacitor by nylon shaft (reduces/eliminates hand capacitance issue). Assembled it measures approximately 36 inches tall with base and 33 inches wide. Outer loop coils to approximately 15-18 inches for storage. These antennas are entirely built by W2LI club members, and all proceeds are used for fundraising efforts for club activities, including repeater maintenance, equipment repair/replacement, club activities including remote HF activation, and Field Day. Please note, the user supplies their own coax to connect the loop to transceiver. Additionally, the tripod shown in photos is not included. 10 watts CW/Digital (PSK/JT65/WSPR) 20 watts SSB. 7 MHz to 14.350 MHz continuous. 6 MHz to 15 MHz. 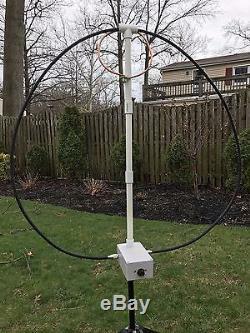 This transmit QRP magnetic loop antenna can create dangerous high voltages (in excess of 1 kV) across the capacitor plates, as well as the coax loop PL259 connectors. Additionally, one can receive RF burns by touching the copper transmit loop while transmitting. The capacitor has been electrically isolated from the tuning knob by means of a nylon shaft. As with ANY antenna system, care should be taken during operation to prevent anyone from coming into contact with these parts during transmission. Bility for any damages or loss of any kind that might arise from the use of, misuse of, or the inability to use this product. 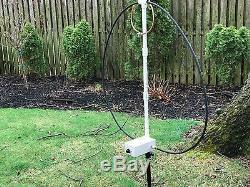 The item "QRP Magnetic Loop Antenna (PREORDER)" is in sale since Sunday, November 25, 2018.